This Saturday they will be LIVE from the Select Security Stadium in Widnes, bringing you a full day of Drum Corps to your homes, for FREE! 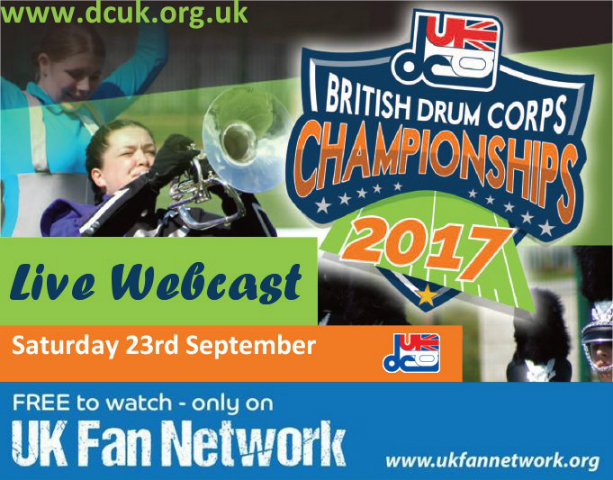 DCUK and UKFN are excited to be able to bring you another live webcast – only this year we’re bigger and better. From 12.40pm they will give you a rundown of the day’s events followed by all 9 Open Class Corps in Prelims competition as well as the semi-finals of Drumline Battle. After a short interval they will be back at 17.40 with the build up to Finals and 11 more performances from the Junior and Open Class Corps. You can stay with us right through retreat and the awards ceremony, and, time permitting, the encore from this year’s British Drum Corps Champions. Our program will be hosted by Joe Fitzpatrick and Michelle Vaughan, and we’re also pleased to announce that joining the team this year, down on the field, will be Tammy Clegg. Tammy will be in the thick of the action, speaking to members from the competing units throughout the day. Posted by News Editor on Thursday, September 21st, 2017. Filed under Current News, Drum Corps U.K., FrontPage Feature.